SAPK3 antibody LS-C114599 is an unconjugated mouse monoclonal antibody to human SAPK3 (MAPK12 / ERK6). 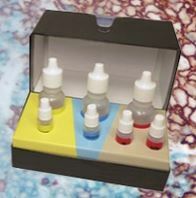 Validated for Flow, IHC and WB. Protein expressed in 293T cell transfected with human MAPK12 expression vector. 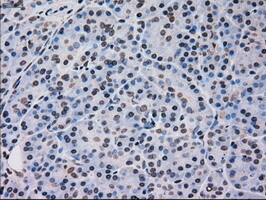 IHC of paraffin-embedded pancreas tissue using anti-MAPK12 mouse monoclonal antibody. (Dilution 1:50). 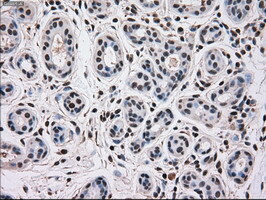 IHC of paraffin-embedded breast tissue using anti-MAPK12 mouse monoclonal antibody. (Dilution 1:50). HEK293T cells were transfected with the pCMV6-ENTRY control (Left lane) or pCMV6-ENTRY MAPK12 (Right lane) cDNA for 48 hrs and lysed. Equivalent amounts of cell lysates (5 ug per lane) were separated by SDS-PAGE and immunoblotted with anti-MAPK12. 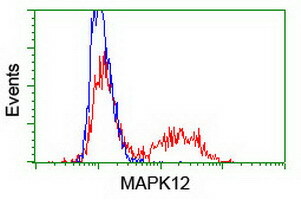 HEK293T cells transfected with either overexpress plasmid (Red) or empty vector control plasmid (Blue) were immunostained by anti-MAPK12 antibody, and then analyzed by flow cytometry.